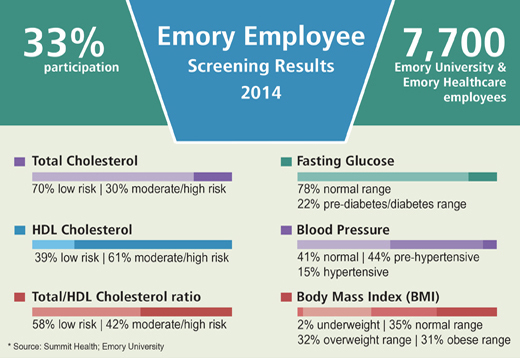 Emory's popular "Know Your Numbers" campaign is back for 2017, giving employees the opportunity to gain valuable health information through free, onsite health screenings that measure blood pressure, cholesterol, glucose and more. The screenings were last offered in 2014, when almost 8,000 employees participated. Here is a summary of the results. For many of us, the new year heralds a renewed commitment to improving health, with goals of weight loss, new fitness routines or healthier eating. Having a sense of your primary health measures can be a helpful starting point for personal transformation. However, it’s one thing to know you could lose a few of the holiday pounds you gained by hanging out next to the dessert table — it’s quite another to find out that you may be at risk for (or have) undetected pre-diabetes, high cholesterol or hypertension. Routine health screenings can help us understand if we are at risk of developing health issues, which is why Emory is once again offering biometric health screenings for faculty and staff. The "Know Your Numbers" campaign launched Jan. 17 and continues through Feb. 28. Through a partnership with Provant, an industry leader in employee health programs, Emory will offer free, convenient, onsite health screenings that measure key biometric numbers such as blood pressure, cholesterol, glucose and body composition. When Emory first began offering biometric screenings, leaders were surprised by how much of an impact these health checks would have on employees and the organization as a whole. Of those participating in the 2014 screenings (the last time the screenings were offered), 99 percent of participants valued receiving a quick and easy snapshot of their health status. For others, the simple, 15-minute screenings identified previously undetected red flags that indicated their health may be at risk, inspiring important conversations with health care providers and subsequent lifestyle changes. Many employees shared their personal stories of how the screenings actually revealed a previously undetected risk of diabetes, hypertension or cardiac disease. On an organizational level, the aggregated numbers from the screenings offered Emory leadership valuable insight in the ongoing development of the Healthy Emory strategic plan, and the creation of programs designed to meet the health needs of Emory employees. To benefit from the health screenings, register online or call 1-877-239-3557. Because of the limited slots available, employees are encouraged to register early and registrations close 24 hours before the scheduled event. Those unable to attend one of the onsite biometric screening events can log in on Provant's Healthy Emory site to download a form that can be filled out by their primary care provider. The next step is for participants to plug their biometric screening results into Aetna’s Compass online health risk assessment (found on www.Aetna.com). This 15-minute questionnaire uses the biometric results and the answers from a series of health behavior questions to help employees develop an easy-to-implement health action plan. Best of all, completing both the biometric screening and the online health risk assessment can earn employees a $150 medical plan incentive — either a credit against their deductible for those on the POS Plan or a contribution to their health savings account for those on the HSA Plan. While the incentives do inspire some people to participate in the programs, Michael Staufacker, director of health management at Emory, emphasizes that saving money isn't the most important goal.